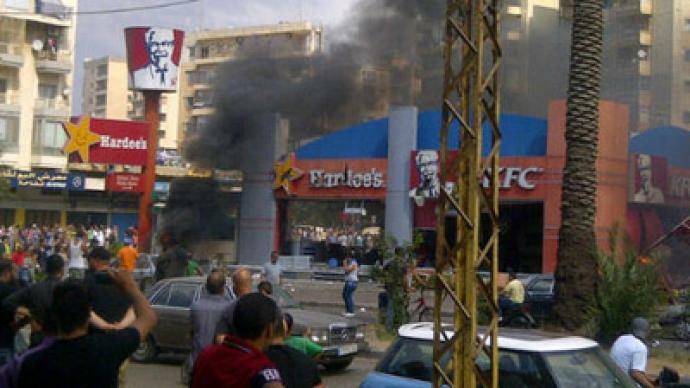 Demonstrators in Tripoli, Lebanon, burned down a restaurant belonging to US-based chain KFC in protest against an anti-Islamic film mocking the Prophet Muhammad. At least one person was killed and 24 were wounded in the clashes with police. Following Friday prayers, hundreds of demonstrators massed in protest against the Pope's three-day visit to Lebanon and shouted anti-American slogans. The chants included "We don't want the Pope," and "No more insults [to Islam]," witnesses reported. Security forces fired warning shots into the air in an attempt to disperse the protesters, who marched from Tripoli’s Al-Mansouri Mosque to nearby Nour Square. Another 300 protesters marched a half-kilometer down the road and attacked an American fast-food chain, setting the building on fire. The restaurant’s employees were evacuated. 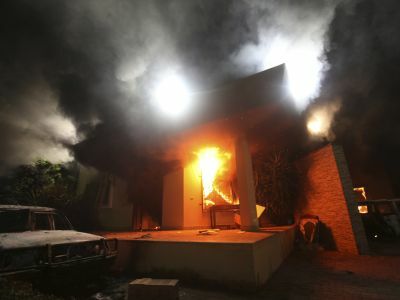 Following the torching of the American restaurant, the Tripoli protesters regrouped and attempted to storm the Prime Minister’s headquarters at the Grand Serail. Witnesses in the area claimed they heard gunshots. Lebanese officials confirmed that one person was killed and 25 were wounded in clashes between protesters and security forces, which then cordoned off the area to block the demonstrators’ advance. Twelve members of the security forces were wounded by stones thrown by protesters, Reuters reports. The Lebanese Broadcasting Corporation International (LBCI) reported that unknown assailants opened fire near the Tripoli Serail, prompting security forces to fire back, RT's Lucy Kafanov wrote on Twitter. 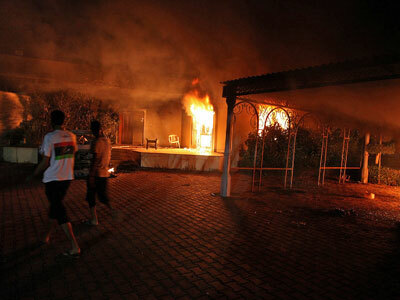 Lebanon is just another in a handful of countries hit by the wave of outrage sparked Tuesday by the anti-Islam movie “Innocence of Muslims.” In the most violent display of discontent so far, an armed mob killed four US diplomatic staff, including the ambassador to Libya, during an attack on the US Consulate in Benghazi. 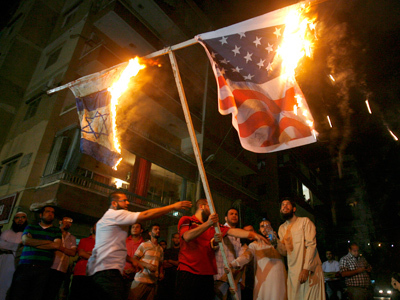 On Thursday, Muslim protesters clashed with police near the US embassy in Cairo for the third consecutive day. 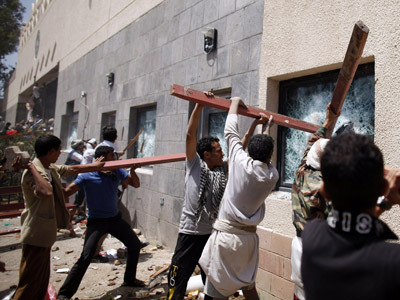 Meanwhile, in Yemen at least four protesters were killed and dozens more injured when security forces opened fire at protesters after hundreds stormed the US Embassy in Sana'a, the country's capital.